In his third-person memoir, Salman Rushdie reveals how he turned to Super Mario while in hiding. Salman Rushdie is perhaps most famous for his 1988 novel The Satanic Verses and a subsequent fatawa that forced him into hiding. You may also remember a 2010 interview in which Rushdie stated that Iran could be liberated by dropping Nintendo consoles from the sky. Apparently Rushdie's rationale for the latter has a lot to do with his experiences during the former. 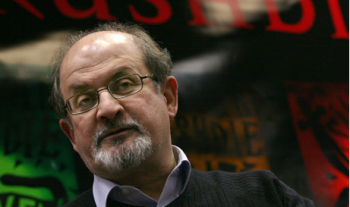 In a new third-person memoir titled Joseph Anton, Rushdie revealed that while in hiding he gained a deep appreciation for videogames thanks to none other than Super Mario himself. "Marianne came around and scolded him for playing video games," the book reads. "Thanks to Zafar (Rushdie's son), he had grown fond of Mario the plumber and his brother Luigi and sometimes Super Mario World felt like a happy alternative to the one he lived in the rest of the time. 'Read a good book,' his wife told him scornfully. 'Give it up.' He lost his temper. 'Don't tell me how to live my life,' he exploded, and she made a grand exit." It's fascinating to imagine the renowned writer becoming engrossed in a video game, and frustrated by distractions from it, just like any other player. More surprising is the fact that Super Mario World may have inspired Rushdie's later fiction. In Luka and the Fire of Life, Rushdie depicts the hero "Super-Luka" on his quest to steal the titular fire for his dying father. Luka is granted 999 lives to surpass a series of increasingly difficult levels, and even saves his progress periodically by punching a gold ball at the end of each section. Rushdie's love of games doesn't stop at Mario either, but encompasses everything from Angry Birds to Red Dead Redemption. To Rushdie, videogames can provide engaging narratives that don't require the author to guide players through its story by the hand. "There are all kinds of excursions and digressions that you can choose to go on and find mini stories to stories to participate in instead of the big story, the macro story," Rushdie said. "I think that really interests me as a storyteller."